Cancer-related financial toxicity (CRFT) is a national crisis hiding in plain sight. Our team has published a comprehensive white paper to change that. 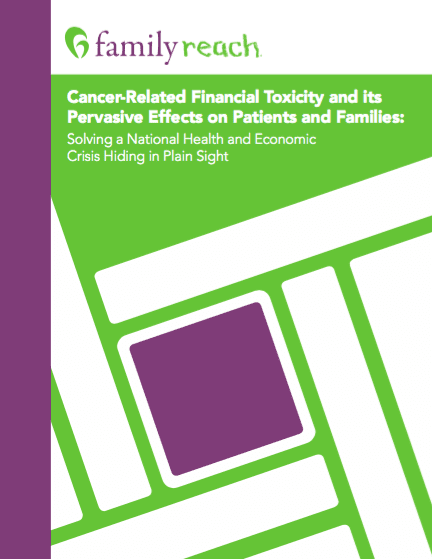 Developed in conjunction with our Medical Advisory Board and partners at Xcenda, Cancer-Related Financial Toxicity and it’s Pervasive Effects on Patients and Families: Solving a National Health and Economic Crisis Hiding in Plain Sight – is the first consolidated report providing an in-depth look at cancer-related financial toxicity. Below is a brief summary of the report’s findings. For the full report, click here. Cancer cuts many household incomes in half as patients and caregivers put careers on hold because of treatment needs. Families quickly become overwhelmed by lost income and increased out-of-pocket costs associated with treatment. As a result, they face higher mortality rates, the inability to adhere to their treatment plans and bankruptcy. This is what the oncology community has deemed CRFT, and a majority of the 1.6 million families facing cancer each year will experience some element of it. How is CRFT impacting our community? CRFT impacts patients and families of all ages and backgrounds. Who is at risk for CRFT? Several populations are at increased risk for CRFT. These include those with poorer financial health at the time of diagnosis, younger adult patients and those with high cost-sharing insurance plans. Younger adult patients recently diagnosed with cancer have 2-5 times higher rates of bankruptcy compared with elderly patients ≥65 years old with cancer. 42% of insured cancer patients reported a significant, or catastrophic, financial burden of increasing out-of-pocket costs, including expenses, travel costs, and insurance premiums. Our white paper aims to highlight a path forward to better mitigate CRFT for families. While Family Reach and other non-profit organizations contribute assistance to pay mortgages, utility bills, car payments and more, this approach is not a scalable long-term solution. A broader community effort to address the systemic problem of CRFT must engage the housing, utility, transportation, food and banking industries. Together, we can help families overcome cancer.